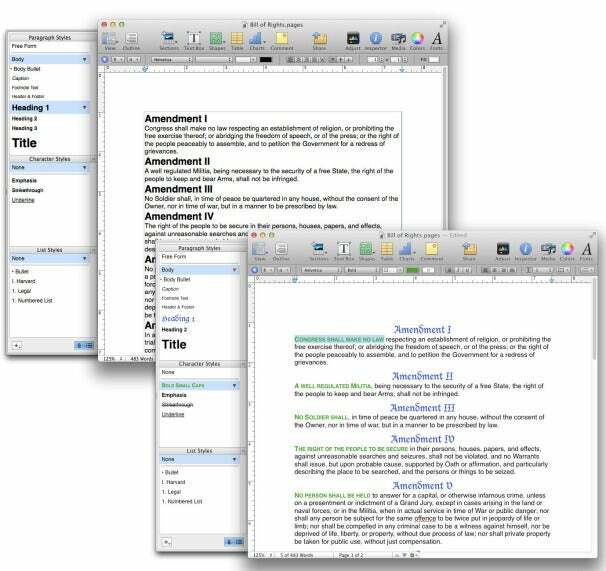 Far more than Apple’s “version of Word,” Pages ( ) is full of powerful, time-saving features that help you make great word processing documents quickly. Three of the best are styles, templates, and tables. Gain some familiarity with these features and you’ll make better documents in less time than ever before. Here are nine tips to get you started. Use styles to format text quickly and consistently. Paragraph styles affect an entire paragraph, whether you’ve highlighted every character of it or simply clicked anywhere in it. Clicking is faster, so don’t bother with the careful selecting. To apply a style, you can use the Styles Drawer (View -> Show Styles Drawer), or better yet, use keyboard shortcuts. With the Styles Drawer open, control-click a style name and then, in the menu that appears, choose Hot Key, and select from the shortcut choices in the menu. Now, applying a style is as simple as clicking in a paragraph and pressing this key. Want to redefine a paragraph style? Format one instance of it by hand, click anywhere in it, and then (in the Styles Drawer) Control-click its name and choose Redefine Style From Selection. Voila! Every paragraph with that style is updated with the new formatting. Character formatting is similar—just be sure you’ve highlighted the formatted text before Control-clicking the style name in the Styles Drawer. Defining a new style from scratch is also a cinch: format a paragraph or some characters by hand, then click the plus-sign (+) button at the bottom of the Styles Drawer. In the New Paragraph Style or New Character Style window that appears, type in a name, and click OK. For paragraph styles, you can Control-click in the paragraph and select Create New Paragraph Style From Selection. When you use Pages' styles, it only takes a few clicks to transform your document's look. If you already have styles in one Pages document, you can reuse them in another, saving time and ensuring consistency in your written materials. Choose Format -> Import Styles, navigate to the document in the open dialog box that appears, and then click Open. You’ll see a list of every style in that document. While you can certainly import them all, if you hold the Command key down you can pick just the ones you want. You can choose to replace duplicates with the imported styles, or to retain both (in that case, a “2” is added to the imported style name). Pages' Template Chooser lets you browse through templates for all different kinds of documents. Use the slider at the bottom to adjust the thumbnails' size. Templates give you an enormous head start on your documents. Pages sorts its templates into two basic groups: Word Processing (for text-centric documents like letters and reports), and Page Layout (for things like newsletters, flyers, and brochures). Each template contains professionally-designed styles, and with the exception of the Blank templates, each contains placeholder text which you can replace by clicking and typing. Many templates contain more than one type of page. For example, the Reports templates include Covers, Tables of Contents, Chapter pages, Text pages, and Bibliographies. Reveal these different page types in the Template Chooser by slowly moving your mouse horizontally across a template’s thumbnail. Once you’ve chosen a template, add pages to your document using the Sections button (in Word Processing documents) or the Pages button (in Page Layout documents) in the Toolbar. Some of the templates—for instance, Envelopes and Letters in Word Processing, and many in the Page Layout section—accept vCards, a standard format for electronic business cards. If your template has placeholders for name and address, drag in a vCard, or an Address Book entry, to fill in the information automatically. Bonus tip: if you select multiple people in Address Book (or multiple vCards) and drag them to an envelope template, Pages will create an envelope for each one. Documents created using a Business Card template show information from your own Address Book card. To make this work properly, create an entry for yourself in Address Book—complete with Home and Work addresses—and then choose Card -> Make This My Card. Drag contacts from Address Book onto a Pages template to quickly address a bunch of envelopes at once. Choose File -> Save as Template to save a document (you guessed it) as a template. You don’t need to worry about where to save it, as Pages will save your template into ~/Library/Application Support/iWork/Pages/Templates/My Templates by default. If (and only if) you accept the default location, your template will appear in the Template Chooser, in a section called “My Templates,” complete with auto-generated thumbnails. This is a perfect place for business-related documents such as letterheads, envelopes, and contracts. 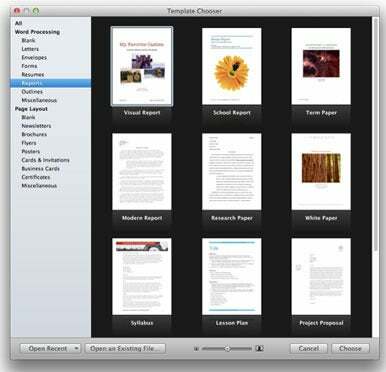 Share templates with colleagues by copying them to the corresponding folders on their Macs. If you like things organized in neat rows and columns, you’ll find Pages’ tables far simpler to use than those in Microsoft Excel or Word. Add a table to a Pages document by clicking the Table button in the Toolbar, or by choosing Insert -> Table. A three-column, three-row table appears, topped by a Header row. Need more rows or columns? Control-click any cell in the table and a pop-up menu gives you options to add rows and columns before or after the cell you’re in. Need a super-lazy way to add a row? Press Tab while in the last cell of a table. If your table crosses a page break, Pages puts a header row on the second page too, repeating the header text from the previous page automatically. Edit a header row by changing the text or formatting, for instance, and Pages updates any other headers associated with the table. While you can resize columns (or rows) by dragging, most table formatting is performed with the Inspector (View -> Show Inspector). Click the Table button in the Inspector to reveal an extensive set of controls. My favorite: the option for Alternating Row Color. The Table pane in the Inspector has two tabs: Table and Format. The Format tab lets you format table entries automatically, much as you might in Excel. Select a cell, row, or column, then choose from options in the Cell Format menu, including Currency, Percentage, and Date and Time. Once you’ve specified the formatting, Pages applies it automatically as you enter data into those cells. For example, you could type 7/27/62 and have Pages convert it to Friday, July 27, 1962. You don’t need to leave Pages to apply simple functions such as Sum, Average, and Count to your table cells. For example, in a report about global warming, you might have a table of temperatures by year. With just a click in the Format section of the Inspector’s Table pane you could compute the average temperature for the 1980s, 1990s, and so on. Don’t see the formula you’re looking for? Create any function you want using the Formula Editor option at the bottom of the Function menu. Bonus: Pages’ functions are live and do not need to be refreshed when the data changes. Christian Boyce teaches people how to get more from their Macs, iPhones, and iPads. He has offices in Santa Monica, California and Austin, Texas.